The largest new model home presently under construction in Old Palm Golf Club, the 9,187-square-feet-under-air Casa Contempo is close to being finished. Private tours of this magnificent custom residence by Couture Lifestyle Homes are now available through the Old Palm Sales Office. The beauty and grandeur of this contemporary home truly come alive when seeing it in person. Casa Contempoâs sprawling layout allows plenty of space for its six bedrooms (including two master suites), six full baths and two half baths. Walk through the light-infused interior, and the sense of space and openness are even more dramatic. Of course, the home also features more intimate areas, such as the extraordinary club room with its state-of-the-art theater. Although remarkably large, the room still feels immensely comfortable and inviting. The residence feels just as spacious outside, as it is beautifully situated on a one-acre home site that overlooks the 13th hole of the Old Palmâs spectacular Raymond Floyd-designed golf course. The view is particularly memorable from the homeâs second story. 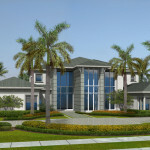 Casa Contempo is priced starting at $7,500,000.